Americans for Tax Fairness (ATF) is a diverse campaign of 280 national, state, and local organizations united in support of a tax system that works for all Americans. It has come together based on the belief that the country needs comprehensive, progressive tax reform that results in greater revenue to meet our growing needs. Had $17.2 billion in profits offshore in 2012 on which it paid no U.S. taxes. Reported it would owe $4.3 billion in U.S. taxes if profits are brought home. Had $42.6 billion in profits offshore in 2012 on which it paid no U.S. taxes. Reported it would owe $11.5 billion in U.S. taxes if profits are brought home. Paid just a 15% federal income tax rate from 2010-2012, less than half the official 35% corporate tax rate – a tax subsidy of $6.2 billion. Had $43 billion in profits offshore in 2012 on which it paid no U.S. taxes. Made $5.7 billion from 2010-2012 and didn’t pay a dime in federal income taxes. Got a tax subsidy of $2.1 billion. Received $10.3 billion in federal contracts from 2006-2012. Made $88 billion from 2002-2012 and paid just 2.4% in taxes for a tax subsidy of $29 billion. Paid no taxes in 4 years. Had $108 billion in profits offshore in 2012 on which it paid no U.S. taxes. Received $21.8 billion in federal contracts from 2006-2012. Made $5 billion from 2009-2012 and paid just $50 million in federal income taxes – a tax subsidy of $1.7 billion. Had $11.6 billion in profits offshore in 2012 on which it paid no U.S. taxes. Received $16.7 billion in federal contracts from 2006-2012. Made $13.6 billion and paid $2.5 billion in federal income taxes from 2009-2012. Paid an 18.4% federal income tax rate, half the official 35% rate – a tax subsidy of $2.2 billion. Had $53.4 billion in profits offshore in 2012 on which it paid no U.S. taxes. Received $8.7 billion in federal contracts from 2006-2012. Saved $4.5 billion in federal income taxes from 2009-2011 by transferring profits to a subsidiary in the tax haven of Puerto Rico. Had $60.8 billion in profits stashed offshore in 2012 on which it paid no U.S. taxes; reported it would owe $19.4 billion if profits are brought home. Received $2.2 billion in federal tax refunds from 2010-2012 while earning $43 billion worldwide even though 40% of its sales are in America. Had $73 billion in profits offshore in 2012 on which it paid no U.S. income taxes. Received $3.4 billion in federal contracts from 2010-2012. Made $19.3 billion in U.S. pretax profits from 2008-2012 but paid no federal income taxes during the period; instead got $535 million in tax rebates. Total tax subsidy: $7.3 billion. Received up to $6 billion in federal contracts from 2011 through 2023. In making their case, corporate executives decry the U.S.’s 35% corporate tax rate claiming it is the highest in the world and makes their businesses uncompetitive globally. The evidence suggests otherwise. Corporate profits are at a 60-year high, while corporate taxes are near a 60-year low [See Figure]. U.S. stock markets are at record levels, and American CEOs are paid far more than executives who run firms of similar size in other nations. 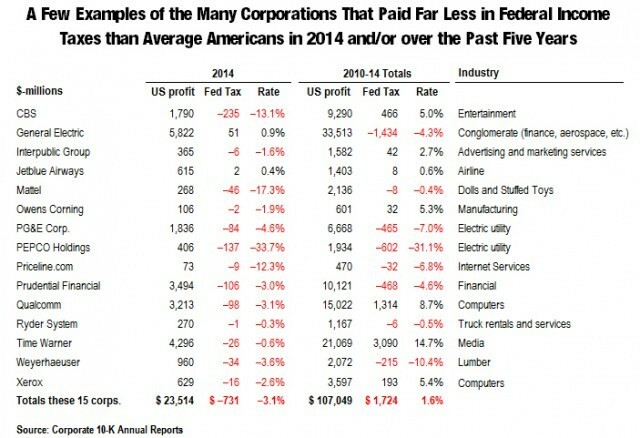 Many U.S. corporations pay a higher tax rate to foreign governments than they do here at home. This entry was posted on Friday, October 26th, 2018 at 00:01	and is filed under Uncategorized. You can follow any responses to this entry through the RSS 2.0 feed. Both comments and pings are currently closed.